Cinnamon may be wonderful added to your oatmeal or inside a hot cinnamon roll, but you might be surprised to know that it comes from the bark of a tropical evergreen tree, the Medicinal Herb Info website notes. Oil and powder from the plant’s bark can be used as a culinary spice or to make medicinal treatments. Recent research has found cinnamon oil to have a number of health benefits; before you begin to use cinnamon oil for your health, consult your doctor. Cinnamon oil has been shown to have powerful antimicrobial and cancer-fighting properties. 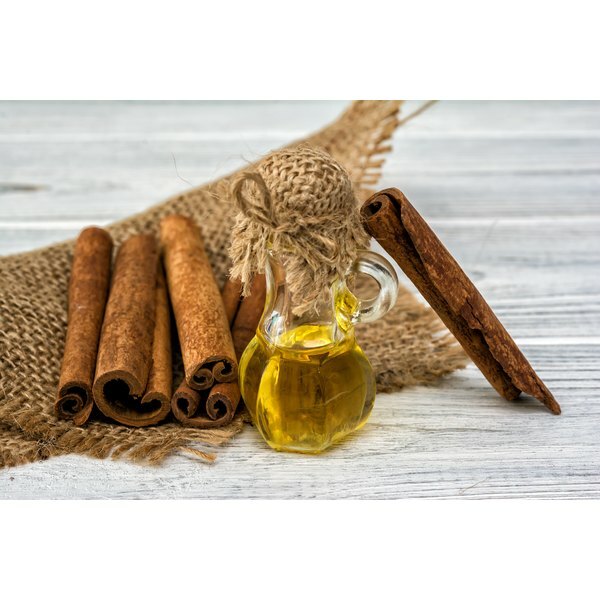 A study conducted at the Turkey's Cumhuriyet University and published in the September 2010 issue of the journal “Food and Chemical Toxicology” concluded that cinnamon oil may be useful as a topical treatment for infections and other skin problems, including benign tumors. Cinnamon oil has also been studied for its anti-inflammatory properties. Research at National Taiwan University, published in the September 2010 edition of the journal “Pharmaceutical Biology,” analyzed cinnamon oil using gas chromatography-mass spectrometry — and found it to have excellent anti-inflammatory properties. The researchers suggest that cinnamon oil may be very useful as a natural treatment for inflammation. Scientists at Korea's Gwangiu Institute of Science and Technology tested cinnamon, both in vitro and with animal test subjects, for its ability to inhibit the growth of various kinds of cancer cells. The results, published in the July 2010 issue of “BMC Cancer,” concluded that cinnamon oil is quite promising as an alternative treatment for cervical cancer, colorectal cancer, melanoma and lymphoma. The study cites cinnamon’s antioxidant, antimicrobial, anti-inflammation and anti-tumor properties as the reason for its effects. Research at the University of British Columbia's Kinsmen Laboratory of Neurological Research, published in the January 2010 issue of “Journal of Alzheimer’s Disease,” examined cinnamon oil in vitro for its potential to inhibit the buildup of amyloid-beta in animals’ brains, one of the conditions that causes decline in Alzheimer's patients. Researchers found cinnamon to be among a group of herbal compounds that showed some promise as a potential treatment. Scientists at Louisiana State University's Division of Biochemistry and Molecular Biology, whose findings were published in the April 2010 issue of “Planta Medica,” studied cinnamon oil in vitro to see how it affected E. coli cells. The results showed that cinnamon oil is able to act as an antimicrobial and antibacterial agent to combat the E. coli infection. The United States Department of Agriculture's Agriculture Research Service studied cinnamon’s ability to treat type 2 diabetes, and published its findings in he May 2010 issue of the “Journal of Diabetes Science and Technology.” Researchers saw that cinnamon was able to normalize the effects of type 2 diabetes in in vitro animal and human tests. The study concluded that cinnamon may play an important future role in treating metabolic disorder, type 2 diabetes and some cardiovascular-related diseases. One common problem in hospitals is the occurrence of urinary tract infections from catheters contaminated with E. coli bacteria. One recent study, conducted by the University of Connecticut's Department of Animal Science, looked at cinnamon oil as a possible solution. In the July 2010 edition of “The Journal of Urology,” researchers concluded that applying cinnamon oil extracts to the surfaces of catheters may be able to help prevent urinary tract infections. Can You Use Cinnamon for a Duodenal Ulcer?